"Who's there? Can you come in here and give me a hand?" 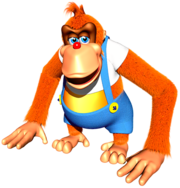 Lanky Kong is an orange orangutan from the Donkey Kong series. He is a Kong whose main affiliation is the Kong Family. Lanky debuts in Donkey Kong 64. Lanky has a red nose and blue eyes. He wears an undersized white shirt, with a red and white checkered patch on the back. He also wears sky blue overalls. In his later appearances, Lanky's hair tuft is more straight. Lanky in Donkey Kong 64. Lanky debuts in Donkey Kong 64 and is the game's one of five playable characters. The others are DK, Diddy, Tiny and Chunky. In the beginning of the game, Lanky was kidnapped by King K. Rool, aside from Diddy, Tiny, and Chunky. Lanky specifically was imprisoned in beneath the Llama Temple of Angry Aztec. Lanky is rescued by Donkey Kong, who must free a caged Llama from a barrel blast challenge. The Llama heads off into its temple, where DK can find it asleep. It sleeps above a lava pool, with a pathway to Lanky's imprisoned room. To swim in the pool, DK must awaken the Llama; in response, it cools the lava into water by spitting in it. In Lanky's imprisoned room, DK must fire at a Coconut Switch adjacent to Lanky's cage. This causes the cage bars to rise, freeing Lanky. He is unlocked as one of the playable characters. Lanky can collect light blue bananas, Banana Bunch Coinss, and blueprints. He also has the ability to transform in to Enguarde in Gloomy Galleon. Donkey Kong is the only other Kong who can transform in to an Animal Buddy: Rambi. Lanky fights Puftoss, the game's fourth boss, and is the first (or only) Kong who fights the second-to-final boss: King Kut Out, a cardboard cutout of King K. Rool. Throughout his adventure, Lanky is provided a grape-firing Grape Shooter from Funky and a trombone from Candy, capable of its "Trombone Tremor" move; this move defeats every enemy, like each Kong's instrument move. Its only required use is on a Music Pad to trigger an area event. Cranky provides Lanky with three unique moves and the three Simian Slam moves, like the other Kongs, at different points in the game. Lanky is first offered the OrangStand ability for three Banana Bunch Coins, starting at Jungle Japes; this move allows him to hand walk, particularly up steep slopes. Lanky is later offered "Baboon Balloon" for five Banana Bunch Coins, starting at Frantic Factory. This move causes him inflate like a balloon and to float a short distance upward, usually toward Bonus Barrels. He is last offered OrangSprint, starting at Crystal Caves. This move allows him to very rapidly hand walk, usually for in races against other characters. Lanky is the third Kong to battle King Krusha K. Rool, the final boss of Donkey Kong 64. Microbuffer reveals before the battle that Lanky set the world record for the longest reach. His role is to stretch out his long arms at a faraway switch, elevating a platform, and on it is a barrel with a large banana peel inside. Lanky must toss it at around the center of the ring. Lanky must use his Trombone Tremor move on a Music Pad the moment he aligns with both the banana peel and K. Rool. He angrily charges at Lanky, but slips on the large banana peel. This process is necessary four times before Tiny's round. Lanky in a group concept art. Lanky does not appear in the E3 2001 trailer of the cancelled title Donkey Kong Racing. However, he was revealed in a group concept artwork with the animal riders from the trailer. Another shows Lanky mounted on Enguarde. This strongly implies that he was planned to be a playable character. Lanky has a cameo in Funky's "Challenge 3: Protect" minigame challenge in the Game Boy Advance remake of Donkey Kong Country 3. In it, Lanky swims in one spot with eight other Kongs. Either Dixie or Kiddy's objective is to protect them from the Kremlings, who drive in speedboats. Lanky reappears in Donkey Kong Barrel Blast as an unlockable racer. He is unlocked when the player wins the Topaz Cup on "Rookie" level. Lanky has high speed while having low boost and agility stats; his in-game rival is Klump. Lanky's bongos are colored dark blue and are spotted white. Lanky does not appear in Super Smash Bros. Melee. The DK Rap song, from Donkey Kong 64, is the background music in the Kongo Jungle stage. The song's lyrics were practically unchanged, and Lanky's verse was retained. Lanky Kong makes a cameo in Super Smash Bros. Brawl as a trophy and a sticker. His sticker is only usable by DK or Diddy, and it increases either one's throwing attack by six points. His trophy description mentions him returning in Donkey Kong Barrel Blast since being long absent from a video game. Trophy description: "One of the more eccentric Kong friends. He's probably the most laid back of the Kongs and has many comical expressions and mannerisms. He uses his long arms to take out baddies and can walk on his hands to climb steep slopes. Sweet! In the recent game Donkey Kong: Barrel Blast, Lanky appears for the first time in years." This page was last modified on 13 August 2016, at 12:41.